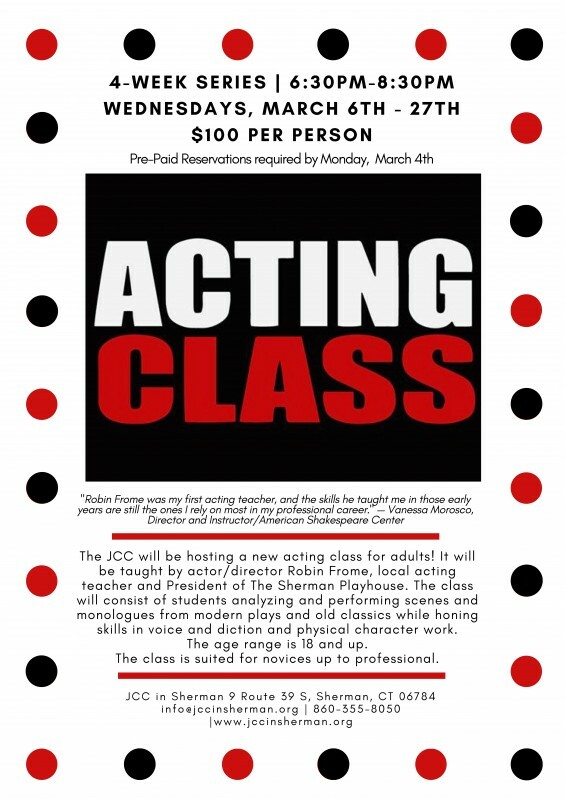 The JCC will be hosting a new acting class for adults! It will be taught by actor/director Robin Frome, local acting teacher and President of The Sherman Playhouse. The class will consist of students analyzing and performing scenes and monologues from modern plays and old classics while honing skills in voice and diction and physical character work. The class is a month to month workshop Starting Wednesdays March 6th-March 27th from 6:30 to 8:30 pm. 4-week series is $100 per person. The age range is 18 and up. The class is suited for novices up to professional.